Universal Studios Super Nintendo World Plans Leaked? A few days after the groundbreaking ceremony in Universal Studios Japan, it seems that some concepts for Super Nintendo World have been leaked. I want to preface that what you’re about to see by making two things clear: 1. There is a slight chance that these are fan concepts. 2. There is a very good chance that even if these are from Universal Creative, they are not final. What you’re about to see are some really rough images that could never reach the public. Even if they do, they’d be cleaned up a bit before being released. Everybody got that, capiche? Here we go. The image above reflects how the land would look in Universal Studios Florida. From all of my personal sources, the exact footprint of the land fits exactly with what I have heard since before this project was announced. Meaning the E.T. Adventure stays, but the Animal Actors Stage, Barney and Fievel’s Playland are going away. 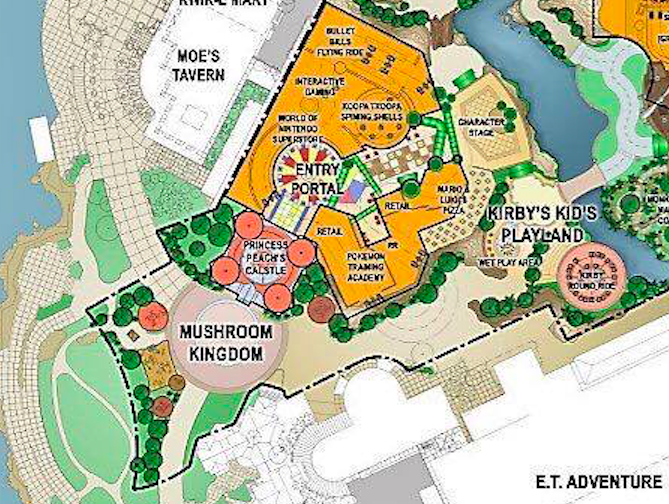 In addition, the land that was once occupied by the former Hard Rock Cafe will be utilized where you see the Super Mario attraction in the upper right. If you notice the entry for the land would fall just outside of the Central Park area by the lagoon in Universal Studios Florida. Princess Peach’s Castle would serve as the weenie to enter Super Nintendo World and you’d enter through an entry portal of sorts complete with interactive attractions featuring Pokemon and other interactive gaming areas. I’ll definitely be covering this more in future articles, but the interactive areas of Super Nintendo World will be what everyone in the industry will be talking about when it opens. If you think interactive Harry Potter wands are cool, you’ve seen nothing yet. 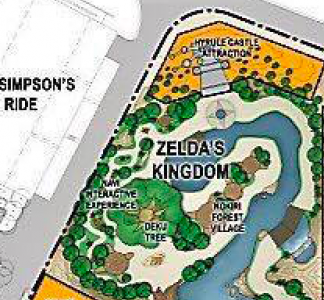 In the upper left you have a section of the land dedicated entirely to Zelda. However, it’s the yellow building towards the top that you should pay special attention to. Hyrule Castle Attraction may be the most unique thing coming to this land. A few months ago, we broke the story of Universal filing a patent for a puzzle theater here. Along with the layout of the land came this interesting piece of concept art. 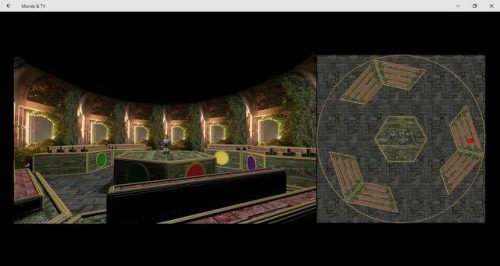 Assuming this is not some fan made dream, Zelda would be the franchise that would use this one-of-a-kind puzzle theater attraction. If you’re unfamiliar, the seats of this theater could move up and down, side to side and even pass over one another. A concept that hasn’t even come close to being done before. Plus, if I understand this correctly, each show could be different based on how the audience interacts with Link. Meaning the theater could move in different directions based on game play. The only thing that was confirmed to the press at the media announcement at the groundbreaking at Universal Studios Japan is there would be a Mario Kart attraction. Not a surprise to anyone in the industry and the above concept art might seem confusing. Assuming it’s real, this would probably mean the attraction would use virtual reality to make it appear you’re racing alongside Mario, Luigi and the gang. Again, I could be wrong, but that’s been my speculation from the beginning. 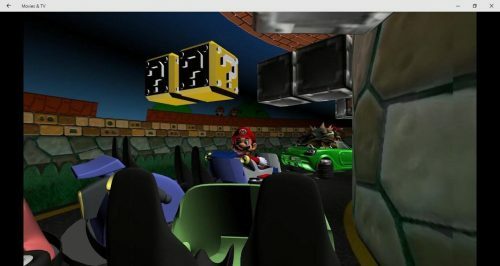 The above image, which was also leaked, seems extremely rough and rather short, but can definitely give a flavor of what you could see in a Mario Kart attraction. 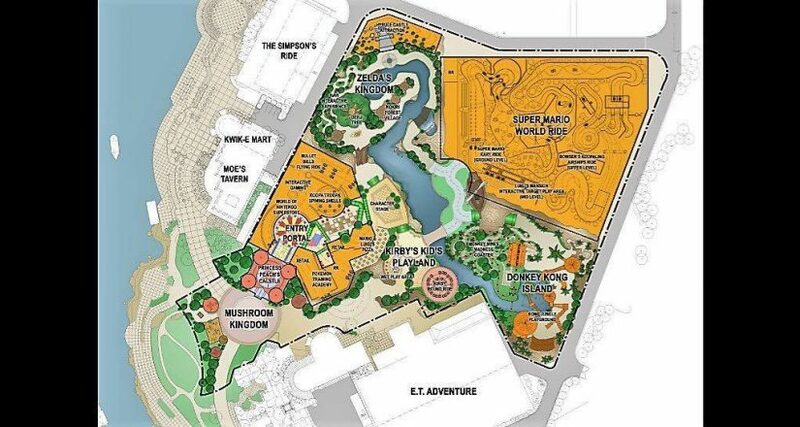 If you notice in the layout of the land, this attraction is only the bottom floor of a massive show building that could house multiple attractions that are Mario-themed. 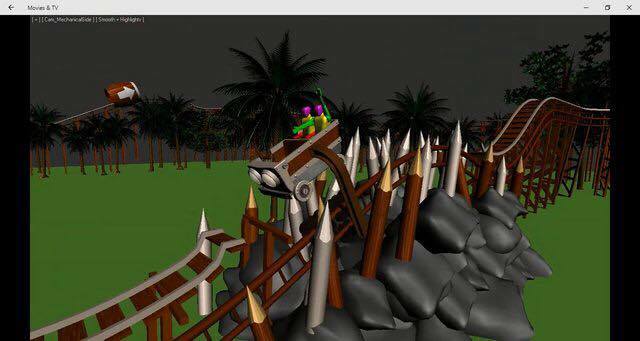 The final piece of potential concept art that was released was this piece of a Donkey Kong roller coaster. Notice how the actual track is below the show track. An arm suspends the actual coaster train above the track that riders see as they move along the course. This would allow you to achieve those cartoon like sequences in the game that a real coaster could not possibly do safely in real life. Finally, based on what I know, these images aren’t entirely correct. 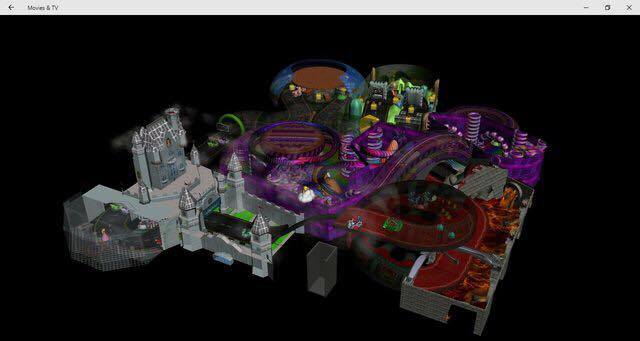 If my sources are right, there is a Yoshi dark ride that has entered the mix since the layout above was made. Also, it’s fair to mention that all of this could still change (assuming it’s the real deal) before Universal starts digging into the ground. So take all of this with a grain of salt. And if it’s real, we will all have something pretty great to look forward to as these Super Nintendo Worlds start opening at Universal Studios Japan, Universal Studios Florida and Universal Studios Hollywood. Your thoughts? This entry was posted in Universal and tagged Mario Kart, Nintendo, Super Nintendo World, Universal Orlando, Zelda. Bookmark the permalink. Trackbacks are closed, but you can post a comment.